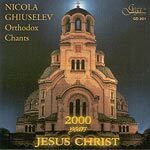 Orthodox chants recorded at Aleksander Nevsky Cathedral in Sofia. Nikola Ghiuselev – bass, artistic director and coductor is Miroslav Popsavov. The performers are Alexander Grechaninov, Priest Vasilii Zinoviev, Michail Strokin, Grigorii Lybimov, Pavel Chesnokov, Dobri Hristov, Petar Dinev, Apostol Nikolaev-Stroumsky. 1 Litany of Fervent Supplication 5'57"
3 We Hymn Thee, We Bless Thee 2'49"
4 Now Lettest Thou Depart 2'54"
5 Blessed is The Man 5'10"
6 The Mystical Sacrifice 4'26"
7 God With Us 3'57"
8 Deliver, O God Thy People 3'57"
9 Praise Ye The Name of The Lord 4'34"
10 The Judicious Villain 2'53"
12 The Legend of 12 Robbers – Russian Folk Song 7'14"